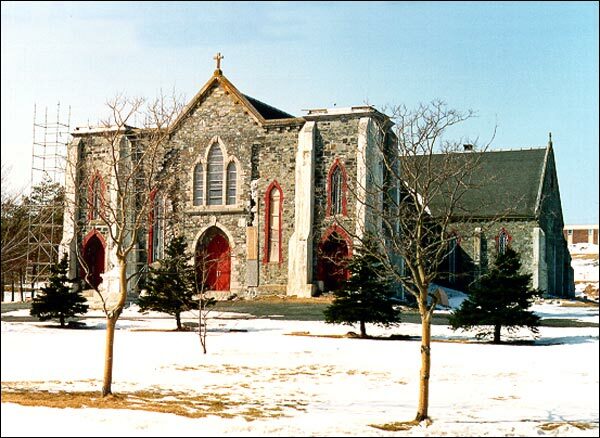 The story of the existing Cathedral of Immaculate Conception begins with the establishment of the Diocese of Harbour Grace and the construction of an earlier cathedral. Bishop John Dalton became the first bishop in the new diocese on June 1, 1856, and among his priorities was the construction of a cathedral. Dalton enlisted the assistance of Rev. Father Henry Carfagnini, a man known for his architectural design talents. The initial Cathedral of Immaculate Conception was modelled on St. Peter's in Rome. Work on the cathedral was far from complete when Bishop Dalton died on May 5, 1869. His remains are interred under the main altar of the present cathedral. The Cathedral is an excellent example of a stone church built in the Gothic Revival style and is the showpiece for the Catholic Church in the region. Carfagnini replaced Dalton as the new Bishop of the Diocese of Harbour Grace and continued work on the church. The cathedral was still not completed when Carfagnini left Harbour Grace in 1880 to accept a position in Italy. His replacement, Bishop Ronald MacDonald, supervised the completion and consecration of the first Cathedral in 1884. The final structure had an estimated value of $350,000. Unfortunately, the parish had failed to insure the church, and it was destroyed by fire on the September 2, 1889. Led by the efforts of the local priest, construction of the second Cathedral of Immaculate Conception began almost immediately. The rubble-wall cathedral was built in a Gothic style with lancet windows and two tower spires on either side of the main entrance. The interior had high-vaulted plaster ceilings through the nave, transepts and chancel. The work was completed and the parish held a consecration service in 1892. The cathedral served as the seat of the Diocese until 1953, when the seat was moved to Grand Falls. The building remained a co-cathedral until 1965, when the seat of the Diocese was fully occupied by Grand Falls. The Diocese included all of the parishes and missions in Conception Bay, along the Northeast coast, and in Labrador. In 1984, the Immaculate Conception Parish celebrated its 200th anniversary and in 1992 commemorated the 100th anniversary of the existing building. Years of wind and weather have taken their toll on the exterior masonry. Restoration work continues on the Cathedral's exterior stone to return it to its original condition. The twin spires were removed from the building to make their restoration easier, and were subsequently repositioned. The Heritage Foundation of Newfoundland and Labrador declared the Cathedral of Immaculate Conception in Harbour Grace a Registered Heritage Structure in April 1990. Also view the Cathedral of the Immaculate Conception Registered Heritage Structure on the Heritage Foundation of Newfoundland and Labrador web site. The Newfoundland and Labrador Heritage Web Site has on its site only a portion of the registered heritage structures in Newfoundland and Labrador. To view a complete list or search for a particular structure visit the Heritage Foundation's Property Search page.